This guide is from the official A-Frame docs. Remix the Basic Guide example on Glitch. We include A-Frame as a script tag in the <head>, pointing to the A-Frame build hosted on a CDN. This has to be included before <a-scene> because A-Frame registers custom HTML elements which must be defined before <a-scene> is attached or else <a-scene> will do nothing. Next, we include <a-scene> in the <body>. <a-scene> will contain every entity in our scene. <a-scene> handles all of the setup that is required for 3D: setting up WebGL, the canvas, camera, lights, renderer, render loop as well as out of the box WebVR support on platforms such as HTC Vive, Oculus Rift, Samsung GearVR, and smartphones (Google Cardboard). <a-scene> alone takes a lot of load off of us! Within our <a-scene>, we attach 3D entities using one of A-Frame’s standard primitives <a-box>. We can use <a-box> just like a normal HTML element, defining the tag and using HTML attributes to customize it. Some other examples of primitives that come with A-Frame include <a-cylinder>, <a-plane>, or <a-sphere>. Here we define the color <a-box>, see <a-box>‘s documentation for the more attributes (e.g., width, height, depth). However, because the default camera and the box are positioned at the default position at the 0 0 0 origin, we won’t be able to see the box unless we move it. We can do this by using the position component to transform the box in 3D space. A-Frame’s distance unit is in meters because the WebVR API returns pose data in meters. When designing a scene for VR, it is important to consider the real world scale of the entities we create. A box with height="10" may look normal on our computer screens, but in VR the box will appear massive. A-Frame’s rotational unit in A-Frame is in degrees, although it will get internally converted to radians when passing to three.js. 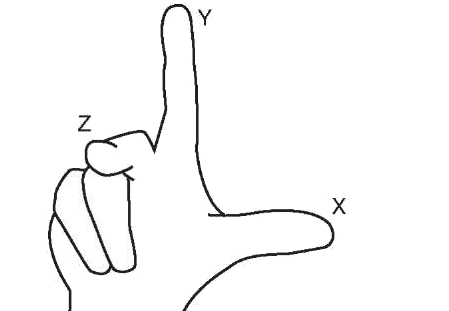 To determine the positive direction of rotation, use the right-hand rule. Point our thumbs down the direction of a positive axis, and the direction which our fingers curl around the positive direction of rotation. This will rotate our box at an angle and double its size. 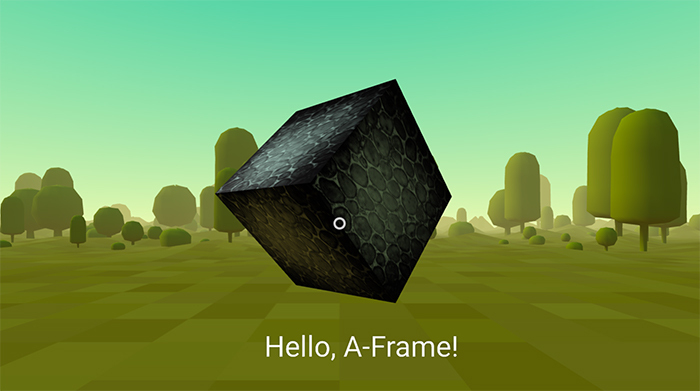 A-Frame HTML represent a 3D scene graph. In a scene graph, entities can have a single parent and multiple children. Child entities inherit transformations (i.e., position, rotation, and scale) from their parent. If we calculate the sphere’s world position, it would be 1 2 3, achieved by composing the sphere’s parent position with its own position. Similarly, for rotation and scale, the sphere would inherit the box’s rotation and scale. The sphere too would be rotated and stretched just as like its parent box. If the box were to change its position, rotation, or scale, it would immediately apply to and affect the sphere. If we were to add a cylinder as a child to our sphere, the cylinder’s transform would be affected by both the sphere’s and box’s transforms. Under the hood in three.js, this is done by multiplying transformation matrices together. Fortunately, we don’t have to think about that! Now we see our box! For flat displays (i.e., laptop, desktop), the default control scheme lets us look around by click-dragging the mouse and move around with the WASD or arrow keys. On mobile, we can pan the phone around to rotate the camera. Although A-Frame is tailored for WebVR, this default control scheme allows people to view scenes without a headset. 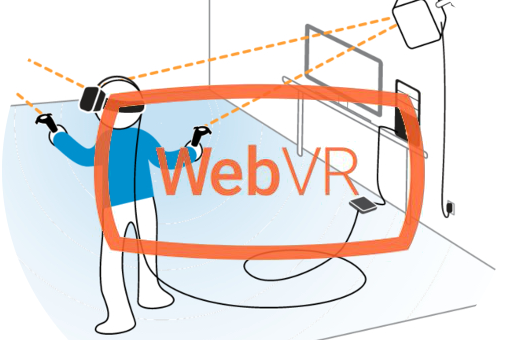 Check out the instructions on the Mozilla VR homepage for setting up and entering WebVR. Upon entering VR by clicking the goggles icon with a VR headset connected (e.g., Oculus Rift, HTC Vive), we can experience the scene in immersive VR. If room-scale is available, we can physically walk around the scene! Make sure you’re serving your HTML using a local server for textures to load properly. We can apply an image texture to the box with an image, video, or <canvas> using the src attribute, just like we would with a normal <img> element. We also should remove the color="red" that we set so that the color doesn’t get blended in with the texture. The default material color is white, so removing the color attribute is good enough. <a-box src="https://i.imgur.com/mYmmbrp.jpg" position="0 2 -5" rotation="0 45 45"
However, we recommend using the asset management system for performance. The asset management system makes it easier for the browser to cache assets (e.g., images, videos, models) and A-Frame will make sure all of the assets are fetched before rendering. If we define an <img> in the asset management system, later three.js doesn’t have to internally create an <img>. Creating the <img> ourselves also gives us more control and lets us reuse the texture across multiple entities. A-Frame is also smart enough to set crossOrigin and other such attributes when necessary. Add <a-assets> to the scene. Define the texture as an <img> under <a-assets>. Give the <img> an HTML ID (e.g., id="boxTexture"). Reference the asset using the ID in DOM selector format (src="#boxTexture"). Previously we had the environment component generate the environment. Though it’s good to know a bit on creating a basic environment for learning purposes. To add a ground, we can use <a-plane>. By default, planes are oriented parallel to the XY axis. To make it parallel to the ground, we need to orient it along the XZ axis. We can do so by rotating the plane negative 90° on the X-axis. To tile our texture, we can use the repeat attribute. repeat takes two numbers, how many times to repeat in the X direction and how many times to repeat in the Y direction (commonly referred to as U and V for textures). <a-plane src="#groundTexture" rotation="-90 0 0" width="30" height="30"
We can change how the scene is lit by using <a-light>s. By default if we don’t specify any lights, A-Frame adds an ambient light and a directional light. If A-Frame didn’t add lights for us, the scene would be black. Once we add lights of our own, however, the default lighting setup is removed and replaced with our setup. We’ll add an ambient light that has a slight blue-green hue that matches the sky. Ambient lights are applied to all entities in the scene (given they have the default material applied at least). <a-animation> may become deprecated in favor of a component form like this Animation Component. We can add animations to the box using A-Frame’s built-in animation system. Animations interpolate or tween a value over time. We can place an <a-animation> element as a child of the entity. Let’s have the box hover up and down to add some motion to the scene. Animate to 0 2.2. -5 which is 20 centimeters higher. Alternate the direction of the animation on each repeated cycle of the animation. Last for 2000 millisecond duration on each cycle. <a-animation> hooks into A-Frame’s render loop such that it is called only once per frame. If you need more control and want to manually interpolate or tween a value, you can write an A-Frame component using the tick handler and a library like Tween.js (which is available at AFRAME.TWEEN for now). For best performance, once-per-frame operations should be done at an A-Frame level, try not to create your own requestAnimationFrame when A-Frame already provides one. Let’s add interaction with the box: when we look at the box, we’ll increase the size of the box, and when we “click” on the box, we’ll make it spin. Given that many developers currently do not have proper VR hardware with controllers, we’ll focus this section on using basic mobile and desktop inputs with the built-in cursor component. The cursor component by default provides the ability to “click” on entities by staring or gazing at them on mobile, or on desktop, looking at an entity and click the mouse. But know that the cursor component is just one way to add interactions, things open up if we have access to actual controllers. To have a visible cursor fixed to the camera, we place the cursor as a child of the camera as explained above in Parent and Child Transforms. If we check the documentation of the cursor component that <a-cursor> wraps, we see that it emits hover events such as mouseenter, mouseleave as well as click. <a-box src="#boxTexture" position="0 2 -5" rotation="0 45 45" scale="2 2 2"
<a-animation> has a feature to begin its animation when the entity it is animating emits an event. This can be done through the begin attribute, which takes an event name. <a-box color="#FFF" width="4" height="10" depth="2"
position="-10 2 -5" rotation="0 0 45" scale="2 0.5 3"
Or we can add positional audio using <a-sound>. This makes the sound get louder as we approach it and get softer as we distance from it. We could place the sound in our scene using position. A-Frame comes with a text component. There are several ways to render text, each with their advantages and disadvantages, A-Frame comes with an SDF text implementation using three-bmfont-text that is relatively sharp and performant. Text Geometry by Kevin Ngo - 3D text. More expensive to draw. HTML Shader by Mayo Tobita - Render HTML as a texture. Easy to style, but can be slow to compute. And that’s the basic example! Remix the example on Glitch. View the example on Glitch.